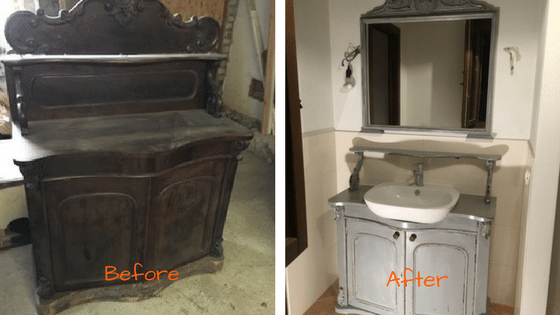 For the ground floor bathroom, Anne wants to use an old piece of furniture as the vanity, rather than having something built in. We had tried looking for such a piece on our July trip, but found that older furniture is not that easy to buy in Italy. There isn’t the number of antiques stores or markets that there is here. We could keep looking on future trips, or we might be able to have something built just for us. Anne sent along some ideas to Johnny, the carpenter who is building our shelving and some custom doors, so we could explore what we might be able to get. Johnny sent us three ideas. 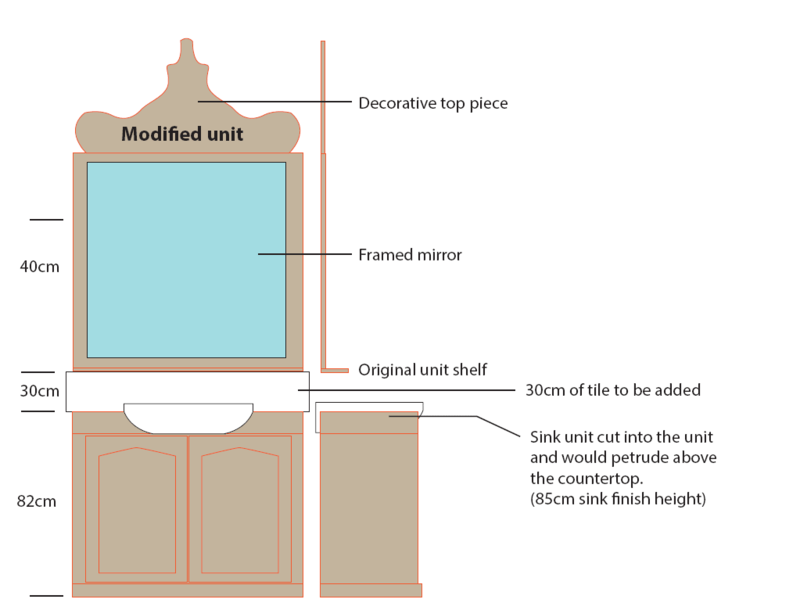 This would be a very simple, mostly open, cabinet made of new wood that the sink would sit on top of. Neither Anne nor I liked this one. 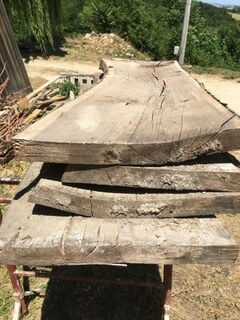 Johnny has found some very old oak planks. 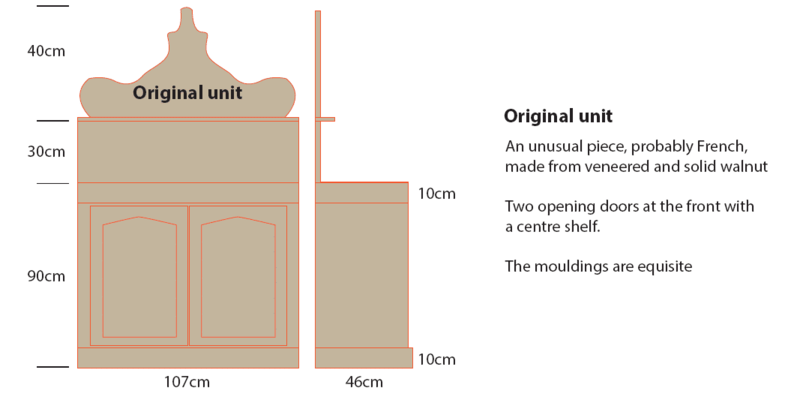 I say “something” because there are two ways to use them: build a cabinet like the one above, or have just “floating” wooden shelves attached to the wall, with the sink on the top one. We both liked the wood, but neither of the executions. This is really what we’ve been looking for from the beginning. 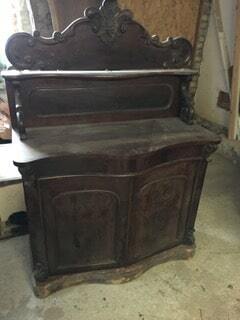 Johnny found this old cabinet, probably French, he thinks, and proposed a way to rework it into a base unit with a framed mirror above. 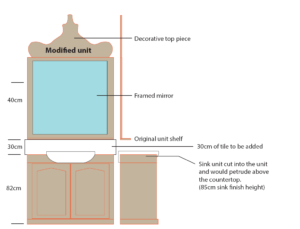 The sink would be slightly sunken into the top to get it to the right height. This all looked very good, except for the use of the top decorative piece as the top of the mirror. It seemed to be a bit too heavy. 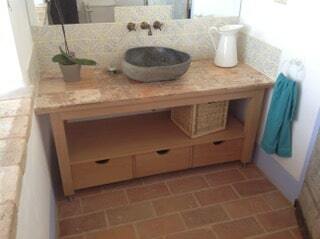 This one is our choice for the vanity. However, we don’t want to walk away completely from either the decorative top or the old oak boards. We may find a place for the top, and we’re going to talk to Johnny about building a desk or a table out of the oak planks. Here’s how it turned out. We think Johnny did a great job. What do you think? Join us and receive new posts by email. Unsubscribe anytime. No spam guarantee. We don't share our list.